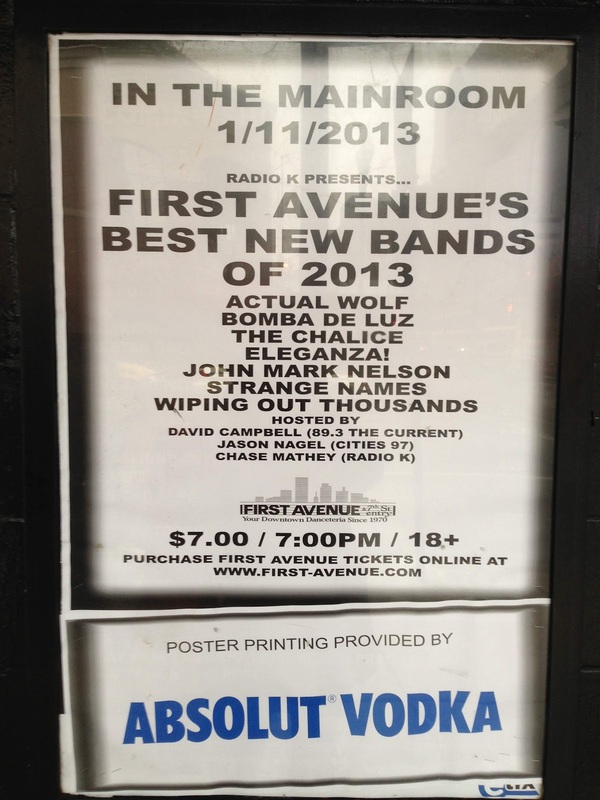 Last years best new bands show was a such a great experience that I couldn't miss this years. This time around it was on a Friday, which brought in a a lot more people than last year, and made it a lot more attractive to attend. Again, this was the First Ave Member get together, one that allowed us to pick up our new cards and our gift (this year was a scarf). We also had the upper stage-right bar sectioned off for us members. We didn't get the 50% off drinks like last year, but that's probably a good thing. 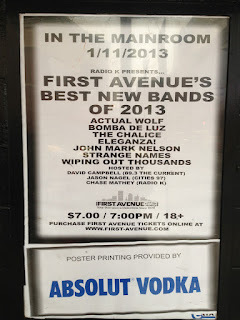 I was able to get a listen of all the bands playing and definitely had my favorites. Unfortunately, a couple that I wanted to see actually played earlier than we arrived. No worry though, the other 2 I wanted to see were on later. Wiping Out Thousands, which sound and perform a lot like Crystal Castles were amazing. I'll need to check them out live again at one of their proper shows for sure. They brought a lot of energy to what had otherwise been a lot of folk-y sounds for the night. If you want me to stop reading a music review of a band description, just insert the work 'folk' or 'alt-country' in the first sentence. Needless to say, up to that point I really didn't care who was playing. The final group was The Chalice which was a trio of ladies that rapped and sang. Sort of a TLC type group. Again, these guys had a lot of energy and definitely got people moving. Although I liked less of the bands this year compared to last year, I still had a great time, and discovered some groups that I'll have to catch live on their own.